These fruits are massive compared to normal blackberries - in fact they are the size of plums! You will be picking fruit in the first year - from late August until first frosts. Once established it will fruit prolifically, giving you around 3.5kg of fruit per season thereafter! It's easy to grow, delicious to eat and a sensation for your garden! Supplied as a 2 year old plant in a 2 litre pot, cut back to 15-20cm to encourage new growth. This is quite simply a real 'Black Beauty'! The fruits are massive compared to normal blackberries - in fact they are the size of plums but as sweet as the sweetest strawberries! 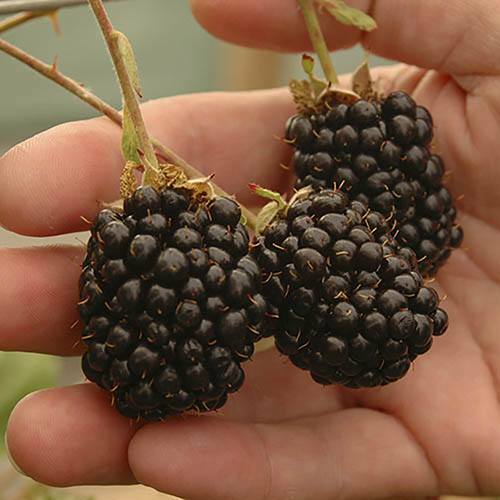 What's more, because it is the worlds first 'Primocane' blackberry, you will be picking fruit in the first year - from late August until first frosts- possibly as late as December! It also has a unique attribute in that it is a 'Double Cropper' - if you prune it as directed in our instructions you will pick fruit in June and July, then from late August to the first frosts each year. Once established it will fruit prolifically, giving you around 3.5kg (approx. 8lbs) of fruit per season thereafter! 'Reuben' has been judged by experts to be twice the size of normal blackberries, as having a sweetness as good as the best tasting strawberries and is simply mouth-wateringly juicy! The summer brings forth a rush of bright white blossom which are followed by berries that turn from green to pink and then black. It's easy to grow, delicious to eat and a sensation for your garden! It can be grown in the garden or in pots on your patio and is completely winter hardy. Buy it now and you will be picking delicious fruit for many years to come! Supplied as a 2 year old plant in a 2 litre pot. In Spring, cut back to 15-20cm tall for new shoots.. Will fruit in the first season. EXCLUSIVE size to YouGarden!